What’s the highest leverage you can give me? What’s the lowest pricing you’ll give me? These two questions may be top of mind for potential borrowers, but the reality is that they’re misconceptions. They’re not indications of the most important factors to take into consideration when borrowing from a lender. Instead, it’s crucial to reframe your priorities and think about the logistics of the loan, which will tell you whether or not you can place your full trust in the lender and operate in a way that’s an efficient use of your time and resources. There is no point in pursuing a loan that will never materialize. Who’s giving me my money? When am I getting it? Who’s giving me my funds? This is the number-one most important question to consider when applying for a loan. Every loan, no matter the lender, comes down to a single person signing the bottom line—and you need to know who that person is. This person is the beneficiary, and your loan will depend on them in order for you to make your investment, so it needs to be someone you know, trust, and ideally have met. At First Bridge, we have our decisionmakers up front, and we help you through each step in the lending process without sharing your information with third parties just to get a quick deal. Our deep pockets give us unparalleled lending power, which means you know who you’re working with and can trust that you’re getting fair terms that are built around context you provide along the way. When am I getting my money? The second most important question to ask is when (and how) you’ll get your funds once your loan is finalized. When defining your loan terms, you need to evaluate your risk and define a deal timeline based around the level of risk you’re willing to take. We’re dedicated to getting you the best advice and designing a loan around your unique circumstances. Our support and expertise is incomparable. 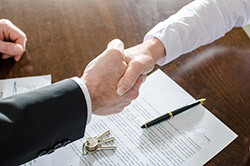 We’ll first talk with you to define your goals, see the property you’re interested in together, and then close a deal that’s best for your objectives. When we know about your specific situation, history, and real issues surrounding your investment, we can help you make an informed, smart decision based on your leverage sensitivity and investment goals. Ready to get started? Contact us today to discuss your loan options.